The first Studio Ghibli film I saw was Princess Mononoke, the 1997 animated fantasy film that conjured up incredible action, memorable characters and wonderfully realised forest spirits. It was a stunning film, and my love for all things Studio Ghibli only grew from there on out. After seeing Princess Mononoke I began to seek out other films on DVD, and quickly made my way through other greats such as Spirited Away, My Neighbour Totoro, Porco Rosso and Kiki's Delivery Service, However, one of my favourites was Grave of the Fireflies, the hard hitting World War 2 tale of a boy and his sister's attempt at survival. It's a bleak and beautiful film, so with this latest Studio Ghibli film being directed by the mastermind that brought us Grave of the Fireflies, I went into it expecting greatness. I was not disappointed. Written and directed by Isao Takahata and out now on Blu-Ray and DVD comes The Tale of the Princess Kaguya, arguably Studio Ghibli's best looking film to date. The plot to The Tale of the Princess Kaguya is based upon the Japanese folk-tale “The Tale of the Bamboo Cutter”, and though it does branch off from the original story in many ways, at its heart it largely remains the same. The film kicks off when a bamboo cutter named Miyatsuko hacks into a piece of bamboo, and in doing so discovers a small girl inside. He brings the miniature girl home to his wife and they decide to raise her, naming her Princess as they believe she might be some kind of spirit or deity. Soon after that Miyatsuko finds gold within a bamboo shoot, and with these riches he moves his family to a mansion, and goes about trying to make his daughter a real Princess. But this life doesn't suit the girl, and The Tale of the Princess Kaguya chronicles her upbringing, her resentment of her new, royal life, and ultimately the true origins of who and what she truly is. 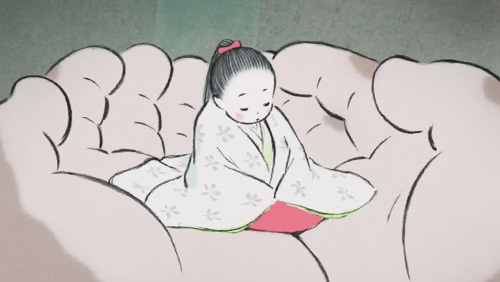 The first thing you'll notice about The Tale of the Princess Kaguya is its animation style. Though Studio Ghibli films always look incredible in terms of design and animation, The Tale of the Princess Kaguya goes one step further, and truly looks like nothing I've seen before. The backgrounds look like beautiful watercolour paintings, characters appear like they've been sketched with charcoal and animation throughout looks incredibly fluid. The film essentially looks like a moving painting, even complete with some backgrounds fading out even before they hit the edge of the film frame. There are also scenes in which The Tale of the Princess Kaguya gets rather minimalistic, and almost looks like some kind of impressionistic painting. It really is breathtaking to behold, and Studio Ghibli truly have outdone themselves in terms of the design and scope of The Tale of the Princess Kaguya. The film itself is perfect. Much like Takahata's Grave of the Fireflies, it treads that line between the joyful and the melancholy, and though it doesn't hit the near depressing depths of Grave of the Fireflies, it is far darker than I thought it would be. Still though, it's a wonderful journey worth taking, and one that is only made better by its lovely cast. I watched the film twice; both with an English voice over, and in Japanese with subtitles. Though I'll always prefer to see a film in its original language, I felt that both choices worked perfectly fine here. Though many English voice over for Japanese films are pretty lame, with names like Chloë Grace Moretz, James Caan and Mary Steenburgen headlining the cast, you won't miss anything by opting for the English voice over. That said, I did prefer the original Japanese cast, with Aki Asakura especially doing a stunning job with the Princess' voice. The Tale of the Princess Kaguya is a film I found impossible to criticize. I came away from it absolutely loving everything about it. Though I'd still consider a handful of Studio Ghibli films better than it, it's still one of their best achievements. From it's great story, stunning visuals, brilliant performances from both its English and Japanese speaking cast to its heartfelt ending, this is truly a special film. Cherish it. The Tale of the Princess Kaguya is a tale worth watching. 5/5.